Allll righty then! -- time to start processing! 1.) Recall Manlius. (Precedes the Batch Proposal, post hoc, or Latin words to that effect.) The idea is to avoid risking attacking the Punic Fleet yet, but if a Commander is there he must attack regardless of his Force’s chances. Recalling him solves the problem; his Fleets recall with him one way or another. 2.) Field Consul Flaminius Deploys against the final Samnite War, with 2 Vet Legions and 8 Regulars. 3.) Dictator Julius and Master of Horse Aelius Deploy against the Gallic War with 10 Legions. This ends the Senate Phase with the departure of the Presiding Magistrate (Julius) from Rome. Up next, the Combat Phase! First, if the Fleets weren’t recalled with Manlius, they automatically recall now. They’re back at Rome in the Active Pool either way. Tracking back through my notes, I discovered the problem: Tripoli originally wanted to distribute cash to Manlius in order to donate to the Republic and so pick up 2 Influence points. Distributions would have worked, but senators must be in Rome to make Donations to Republic cash. He altered that to Aelius, and we readjusted, but I forgot I had already bumped the War card to 20 Influence, too, so I didn’t remember to reduce back to 18. Until now! Anyway, Manny’s true influence is 18, as on the mat. Enough blather about accounting. IT’S TIME TO END THE LOCAL WARS ONCE AND FOR ALL MAYBE! Field Consul Flaminius of the Progressives (and fangirl crush of the Kindly Ones ), vs the 3rd Samnite War! DRM = 10+2+4-8-1= +7. Disaster on raw 5, Standoff on raw 17. 3d6 rolls 6+3+2 = raw 10 (no D/S) +7 DRM = 17. Victory with only one Legion lost! Unrest goes down 1 to 0. No spoils from this War, but the final block of Samnite territory will be properly incorporated into the Roman heartland’s management now. Logistic Pool increases by 5 Fleets and 5 Legions, reaching the maximum logistical limit of Legions and Fleets (per se) in the game, 25 each! The Republic’s annual normal income also increases by 20 Talents to 100! This is the maximum normal or heartland income; other income must arrive in other ways (e.g. from Provinces). 3rd Samnite War is Discarded, the final remnant of the pre-Provincial Wars. 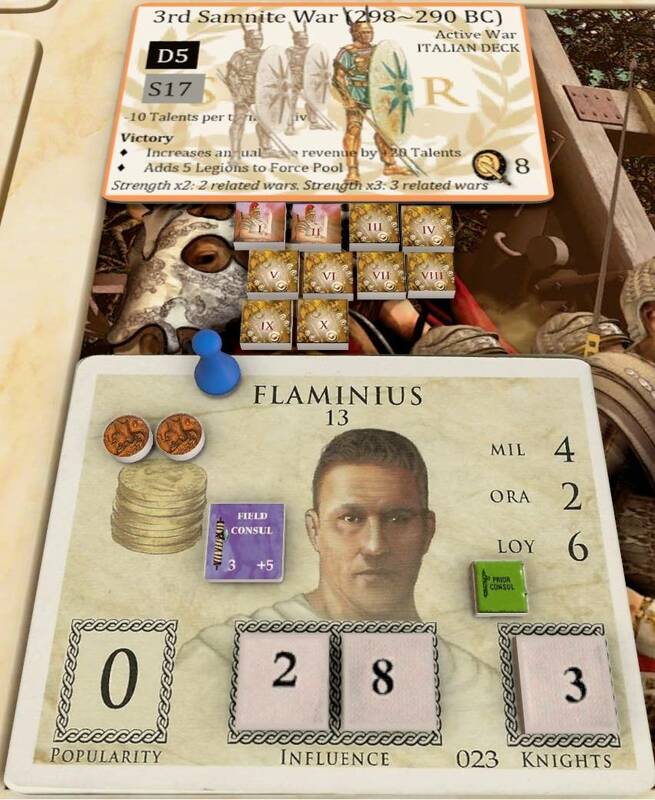 Flaminius gains Inf and Pop of half printed land strength, so 8/2 = 4. Up 4 Influence to 32. (Total Progressive Influence up to 49.) For losing only one Legion in the fight, his Popularity is not then reduced. He must still draw one Mortality chit, to see if the Furias are hot to reward his strenuous efforts! -- but they carry off one of Cato’s relatives instead (family #22). Flaminius is now 3 Influence points away from winning the game by himself automatically. Not bad for a late-entry Faction whose senators seem prone to being carried off by the Furias! Time to roll for the one casualty, starting from the 10th Legion working upward, until someone rolls an odd number. The 8th Legion rolls out, and dies, returning to the logistic potential Force Pool. The 3rd Legion is the oldest non-Vet Legion in the fight, and so becomes (currently Seasoned training) Veteran! Flaminius earns their Loyalty chip. Flam packs up his troops to return to Rome Victorious; he’ll arrive (or rebel!) at the start of the next Phase. 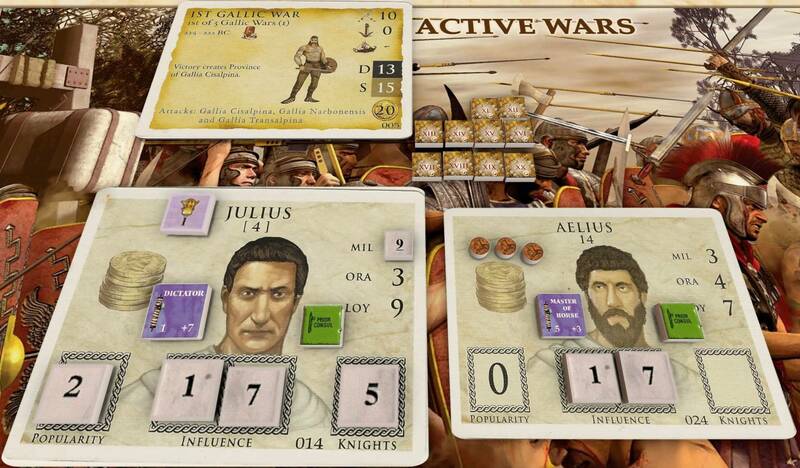 Dictator Julius and his Master of Horse Aelius, of the Militarists, vs the 1st Gallic War! This will be the first Land battle of the Provincial Eras. DRM thus 10+9+1-10-1 = +9. Disaster on raw 13, Standoff on raw 15. 3d6 rolls 6+5+3 = 14 (drilled right thru the D/S, yeesh!!) + 9 = way more than 18. Victory no losses! Unrest would reduce 1, but is already 0. Rome cash up 20 from Spoils to 25. All Legions will go home alive. The oldest Legion in the fight, the 11th Legion, turns (Seasoned) Veteran! -- and Julius earns their Loyalty chit (joining the 1st’s Loyalty). The 1st Gallic War Discards, but generates the first Province of this game: Gallia Cisalpina! It goes to the Forum, to await consideration during the next Senate Phase (at which time I’ll introduce Provinces and discuss the card details). Julius as Commander (but not Aelius as MoH) gains half the Land Strength in Inf and Pop, so +5 Pop from 2 to 7, and +5 Inf up from 17 to 22. (Militarist total Inf up to 57.) He didn’t lose a single Legion, so his Pop doesn’t go down, and he doesn’t have to draw from the Death Bag (nor does Aelius). Julius starts marching for Rome with his Legions (and with Aelius). This ends the Combat Phase, but I have some housekeeping to catch up on before the Revolution Phase. I just noticed according to a house rule, that if a family member of an active senator dies in battle, the senator gains 1 Pop. I haven’t been keeping up with this rule, alas, even though I’m pretty sure I’m the one who devised it! Checking back over my notes, I’ll catch up here. I can’t adjust popularity results after the fact, of course (i.e. where senators’ popularity affected something), but I can at least bring everyone up to date. Turn 1’s Cinc vs the 1st Latin War, 3 chits drawn. Julius Pop up 1. Turn 3’s Camillus vs the Veientine War, Stalemate no losses. Turn 4’s Camillus vs the Veientine War again, Total victory no losses. Turn 6’s Manlius vs the Pyrrhic War, total Victory no losses. Turn 7’s Flaminius vs the 2nd Latin War, total Victory no losses. Turn 8’s Julius of the Militarists vs the 1st Samnite War, total Victory no losses. Turn 9’s Cornelius vs. the 2nd Samnite War, total Victory no losses. Turn 9’s Manlius vs the 1st Punic War’s Navy: 11 (one of the Papirian sons dies), 17 (that’s one of Plautius’ cousins), annnnd 7! -- one of Fulvius’ sisters gets bad news. Each gains 1 Pop. Turn 10 as already noted, Cato gains 1 Pop. Whew! On to the Revolution Phase. Any cards in transit would now be delivered to their new owners, but none are. Players may briefly trade or donate Faction cards with immediate arrival. No one needs to reduce their hand down to 5 Faction cards or less. Erax and Tripoli must each declare whether they intend to rebel, or else hand the Legions back to the Republic. You may not rebel together. If each of you choose to rebel, Julius as the Dictator will take priority and Flam’s attempt will be ignored. Either of you may test the waters before making that decision, by rolling to see which active legions will support you. (Your loyal vets will do so automatically.) You may bribe any Legions once by sacrificing 1 Talent per Legion from your personal treasury, to add +1 to your dice roll. (But the Evil Omens will also subtract 1!) An adjusted result of 5 or 6 will win allegiance. This cannot be done privately, so all Players will see you publicly considering rebellion against the Republic! -- but testing the waters does not count as an official declaration. I’ll have to know your choices before continuing on into Turn 11. ^^ Spoken like a true Republican! Malize distributes his bonus pop point to FabiMax, up from 0 to 1. New total vote tally 27. Quick Question/Reminder-Does the evil omen go away? Flaminius disbands his loyal legion and returns to Rome. Yes, at the start of the next Forum Phase, as with any other randomly generated Event. Mua ha ha ha haaaaa. I'll have to process this afternoon, but now Flaminius is two points away from winning the game by himself outright. I'm honestly a little unsure how anyone could even stop him at this point... aside from sheer luck running against him, all he has to do is patiently wait to vote to oppose a couple of votes for the benefit of other senators (or oppose one vote in favor of one of his senator's gain! ), or to vote a couple of times in favor of another senator's harm (or once in favor of his own harm), and he'd automatically be appointed Consul for Life by the people! Which wouldn't necessarily win the game for him immediately, but as long as there aren't 4+ Wars on the board at the end of the Senate Phase (or at the end of the Combat Phase if so), and as long as Rome doesn't go bankrupt for whatever reason before the end of the Turn, then he'd win. JD (or Jarhead, I forget which), has said that the new forum engine doesn't like the dice rolling module. So for the next Turn I may produce some videos to demonstrate dice rolls and chit picks etc. in as close to real-time validation as I can get. Flaminius hands his Legions back, too, but also allows the 3rd Legion to Disband and retire! -- earning himself 1 extra Oratory point (from 2 to 3), and 1 extra Influence point (from 32 to 33; Faction total now 50). This puts him only two points away from a chance to win the game by himself. The Vet 3rd Legion is placed in a special slot of the Forum, from which it might be Recalled under various circumstances, possibly still Veteran; but if the current Flaminian senator dies then the Legion will return to the Force Pool for potential reformation as a normal Legion. I'll be recording the first Phases of the new Turn tonight, and I'll post when they're uploaded. Then after some degaussing away from the keyboard, I came back and spent about an hour working up the intro and outro credits. Then the video and audio had to compile into an uploadable mp4, which took 3 hours and around 20 minutes. So I've got the video ready to upload, but I'll have to do that later today. It's a good thing I did, too. Because, well... I'll include a time skip to the relevant point for players after I post the video. The rest of it is just introducing and discussing the game and the Factions for any visitors who aren't the six players or haven't been following the game here. Also I wanted to spend a little time complimenting the Players! I might as well go ahead and spoil the results, though; the video is only a demonstration that the results were legitimate. I'll put them behind a spoiler tag for any readers who want to wait for the video (though I can't imagine why...!) But all Players are welcome and encouraged to click through and read the results. After a vigorous shuffle of the Death Bag, I drew an x2. That meant I had to put the x2 back, shuffle again, and draw two more chits. I drew a family number and an x2! That meant I had to keep the family drawn out, put the x2 back again -- there are two or three in the bag, I think two -- and shuffle-pull another two chits! This time I pulled two more family chits, so that was the end of the Death Bag's run this time. Three family chits. One was family 21, if I recall correctly. Smack in the middle of some other families on the board! -- but not an active family yet, so no effect. One was family 5, the Claudians of the Plutocrats! Claudius died, but since he was the Frog's Faction Leader his family card bounced back immediately to him from the Curia. In effect, he simply lost all his chits except for the Faction Leader pawn. Vote Tally and Total Influence were adjusted of course. And the last chit.... which I could not believe... was family 13. You all know who that is. Yep: the Furies decided their beloved Flaminians had produced another heir truly worthy of their attentions, and came to collect him. If Erax didn't have bad luck, he'd have no luck at all! Of course, as before, Flam was still the Faction Leader, so his family card bounced right back to him immediately. But all the chits are gone. Including, most pertinently, the 33 points of Influence. After that, there was no need to continue 'filming' the episode so after some discussion of the implications for any viewers new to the game, and some commentary on where the other Players are ranking now, I ended out. It occurs to me, without reference to the spoiler-tag report details, that the main rules on this topic are waaaayyy too conveniently arbitrary -- a point I spend some time discussing in the video, too. Why would simply crossing an Influence goal automatically result in that senator being appointed Consul for Life? What if another senator was at 34 Influence, and in a Faction with much more total Influence, e.g. what if I.I. 's Scipio Africanus had 34 instead of 24? Wouldn't it make a lot more internal sense for him to be appointed Consul for Life instead, if anyone was going to be? Even if we explained it as a popularity effect (except without reference to popularity!?! ), why wouldn't the Aristocrat 'popularity by influence' be substantially higher and more worthy of OVERTHROWING THE WHOLE REPUBLICAN SYSTEM?! I propose therefore a house rule for consideration. Keep the minimum threshold Influence for engineering a vote for Consul for Life. (I think that's 25, or else it's 20, I'd have to check.) And keep 35 as a determinant Influence number for automatic appointment. But: to make the result more feasible, against long-standing internal resistance against having a king, the house rule would be this. To be automatically appointed Consul for Life, a senator must have 35 Influence more than the second-most Influential senator; and also his Faction must lead in Total Influence by at least a 35 point gap. That won't actually be much more difficult to do, in the late game, which is also part of the point: an automatic win condition shouldn't be likely to trigger until the late game. Any discussion on this is welcome.